This recipe for cold Lithuanian beet soup or šaltibarščiai is made with buttermilk, sour cream, hard-cooked eggs, cucumbers, and dill. It's refreshing on a hot day. This recipe easily can be doubled. And a 14-ounce jar of sliced or shredded beets can be substituted for fresh beets. 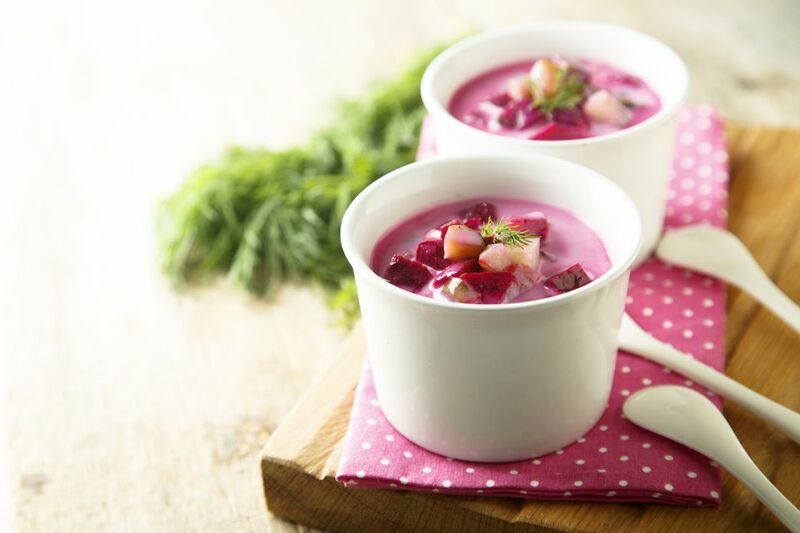 Compare this with Polish cold cucumber-beet soup recipe. There are plenty more beet recipes to try too. While the beets are cooking, chop the onions, cucumbers, and egg whites finely. Un a small bowl, mash the egg yolks with 1/4 teaspoon salt, combine with sliced green onion, and reserve. When the beets are tender, remove them from the cooking liquid (reserve the cooking liquid) and cool them in the refrigerator for at least 1 hour. When cool, grate the beets coarsely. Strain beet cooking liquid and return it to the cooking pot. Add sour cream and buttermilk, blending well. Mix in grated beets, chopped cucumbers, chopped egg whites, and mashed yolk-green onion mixture. Stir until well blended. Adjust seasonings. Pour into a container and refrigerate until well chilled. Taste for seasonings again and adjust if necessary. Serve in a chilled bowl or glass topped with chopped dill.